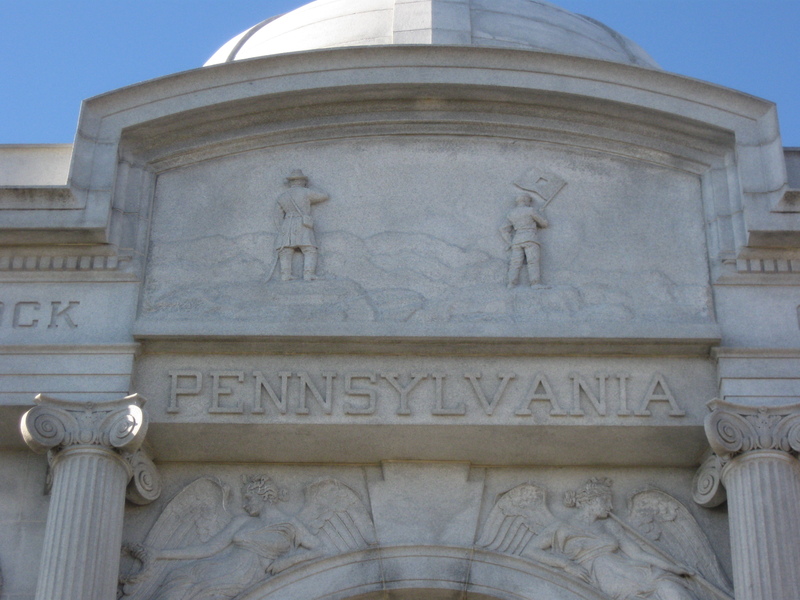 The north and east sides of the Pennsylvania State Monument. 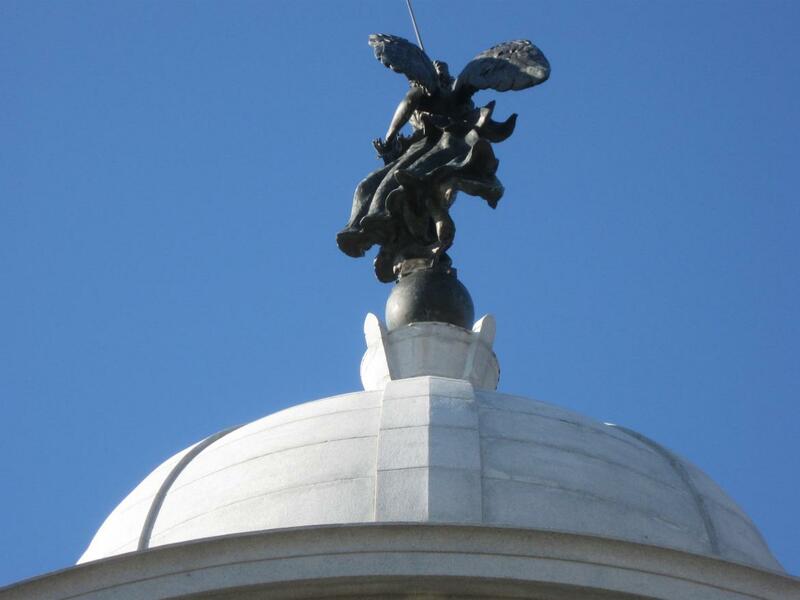 We previously showed some details on the right or north side of the monument. 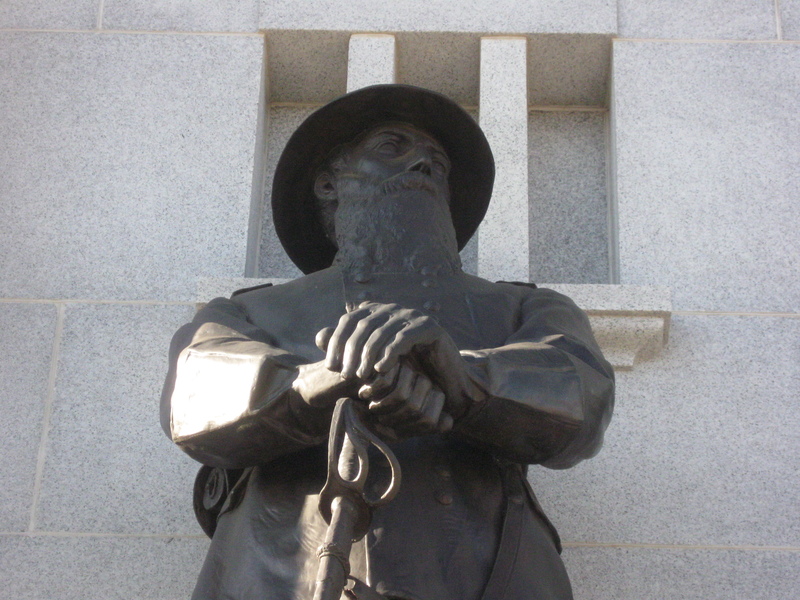 Today we will walk to the left or east side of the monument which was dedicated on September 27, 1910. This view was taken facing southwest at approximately 11:00 AM on Sunday, December 20, 2009. 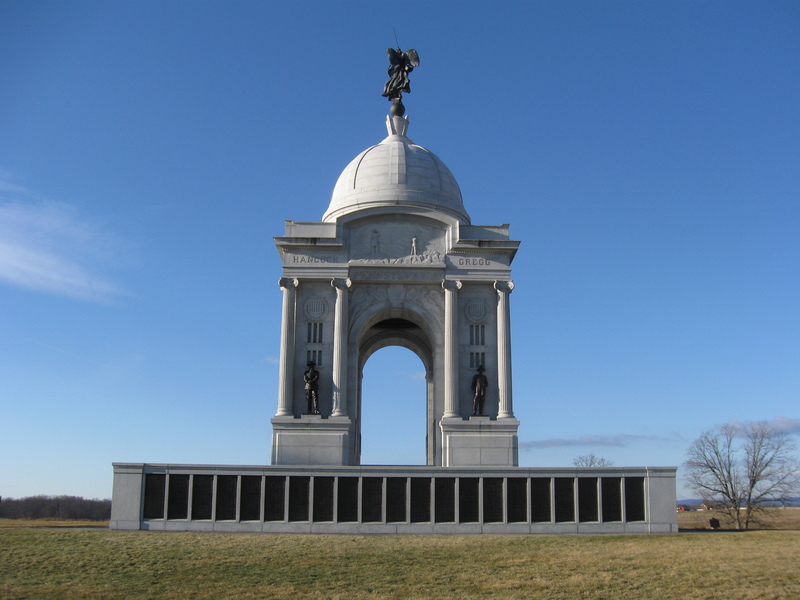 In our first post on the Pennsylvania State Memorial, we began our tour of the monument by showing some items on the north side. 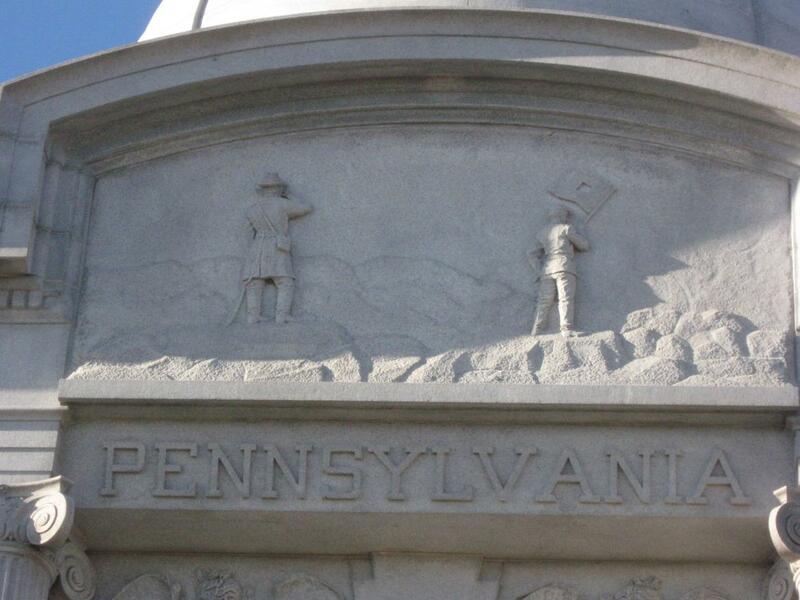 Today we continue our tour of the Pennsylvania Monument by looking at some of the details on the east side of the structure. 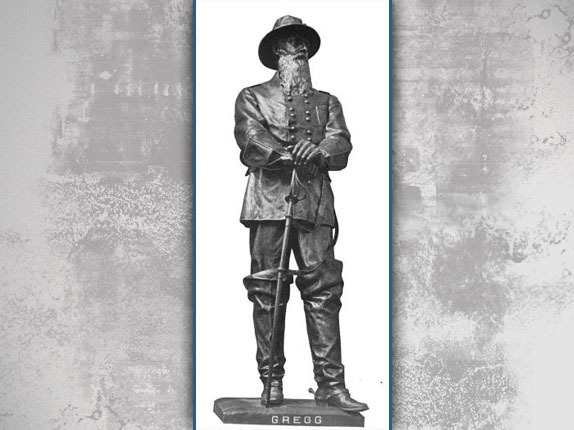 One of the questions asked about the Pennsylvania Monument is why it was located here. No Pennsylvania soldiers did more in this location than Pennsylvania units on other parts of the battlefield. It appears that the Pennsylvania Commission just liked the location. “In selecting the location for the monument, the Commission went over the battlefield carefully, and found the one where the structure now stands the most suitable, in fact, a most excellent one, being on the Union line of battle about halfway between the Cemetery and Little Round Top, and south of the Angle, where statues and monuments are numerous.” This view was taken facing southwest at approximately 11:00 AM on Sunday, December 20, 2009. The snow pictures were taken on on December 20, 2009. This view was taken facing southwest at approximately 11:00 AM on Sunday, December 20, 2009. The pictures without snow were taken on Christmas Day, 2008. This view was taken facing southwest at approximately 9:45 AM on Thursday, December 25, 2008. 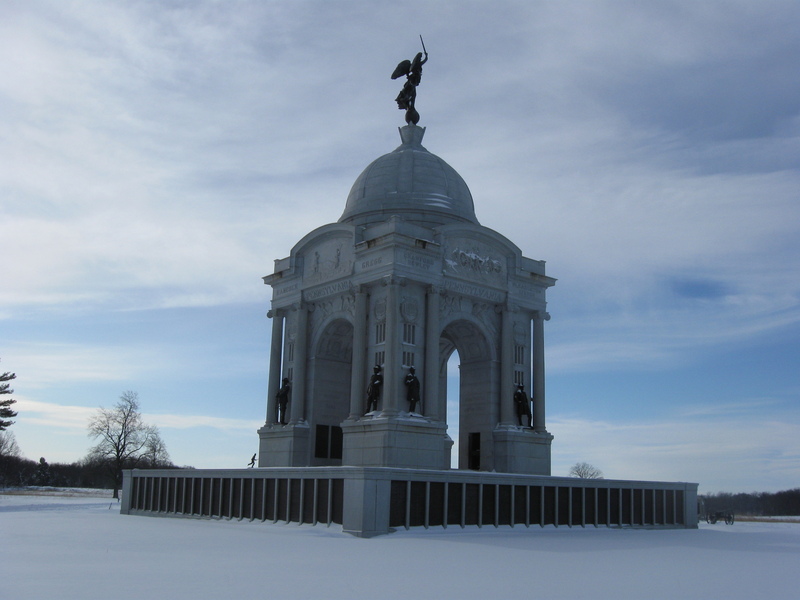 We’ll begin our look at the monument, starting at the top, and working our way down. This view was taken facing southwest at approximately 9:45 AM on Thursday, December 25, 2008. Here is the back of “Victory,” who is 21 feet high and weighs 7500 pounds. This view was taken facing southwest at approximately 9:45 AM on Thursday, December 25, 2008. Farther down are a couple of other items that “caught our eye.” This view was taken facing southwest at approximately 9:45 AM on Thursday, December 25, 2008. 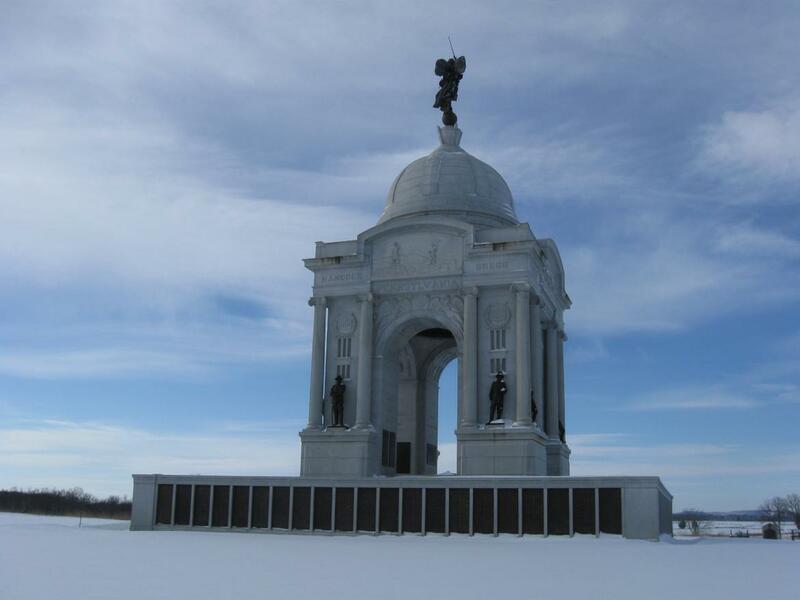 There are four monoliths on the monument, each one depicting a different branch of the service. This one on the east side, of course, represents the Signal Corps. This view was taken at approximately 9:45 AM on Thursday, December 25, 2008. This view of a model of the monolith was taken circa 1910. 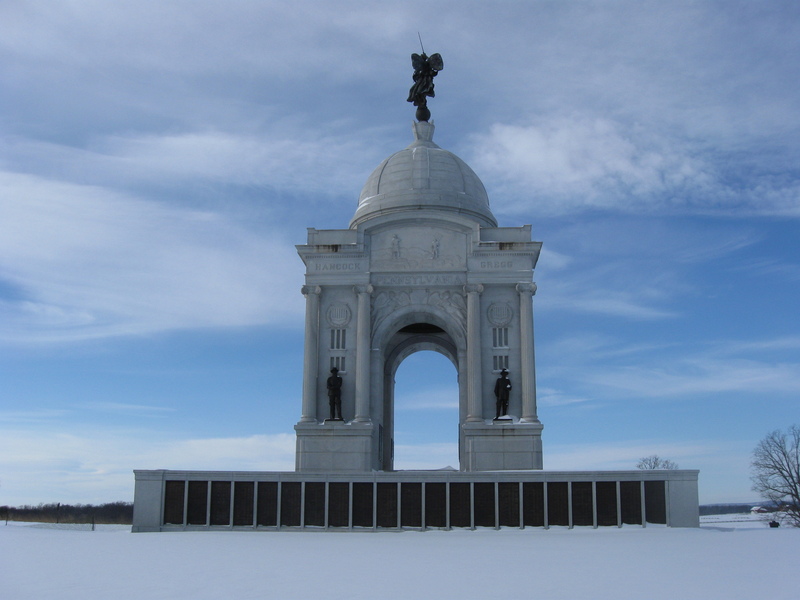 The names on the outside of the monument represent Army, Corps, and Division Commanders from Pennsylvania. Major General Winfield Scott Hancock’s name, on the southeast side of the monument, is above… This view was taken facing southwest at approximately 9:45 AM on Thursday, December 25, 2008. 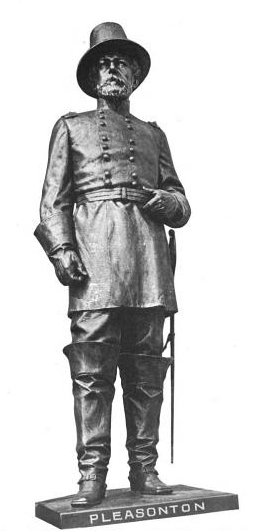 …the statue of Brigadier General David McMurtrie Gregg. This view was taken facing southwest at approximately 9:45 AM on Thursday, December 25, 2008. 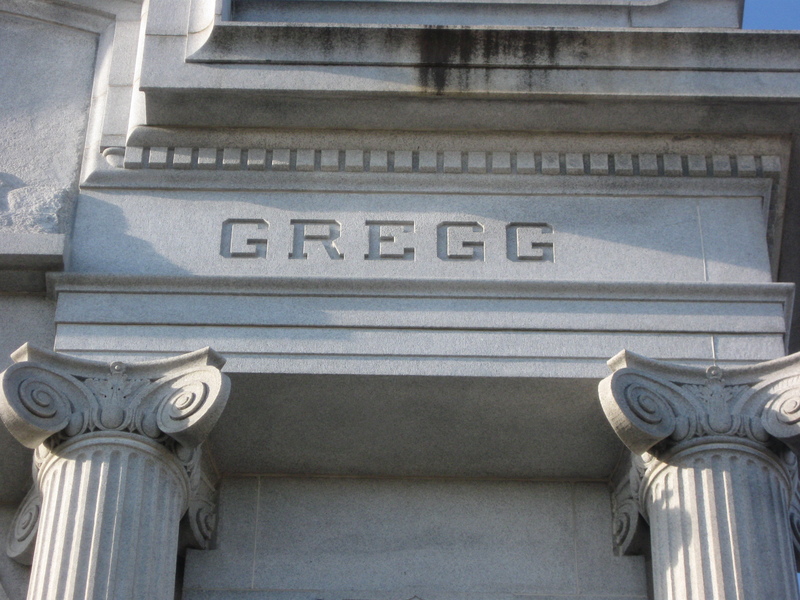 Brigadier General David McMurtrie Gregg’s name, on the northeast side of the monument, is above… This view was taken facing southwest at approximately at approximately 9:45 AM on Thursday, December 25, 2008. 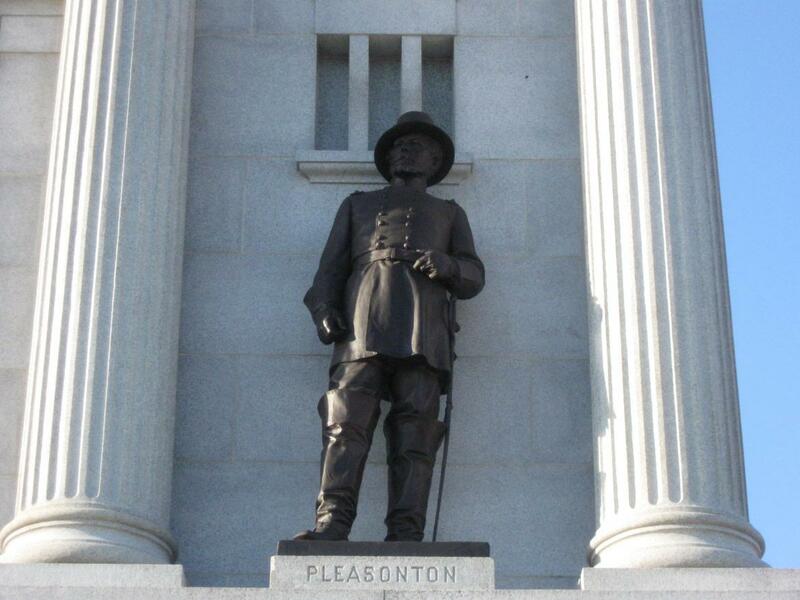 …the statue of Major General Alfred Pleasonton. This view was taken facing southwest at approximately at approximately 9:45 AM on Thursday, December 25, 2008. 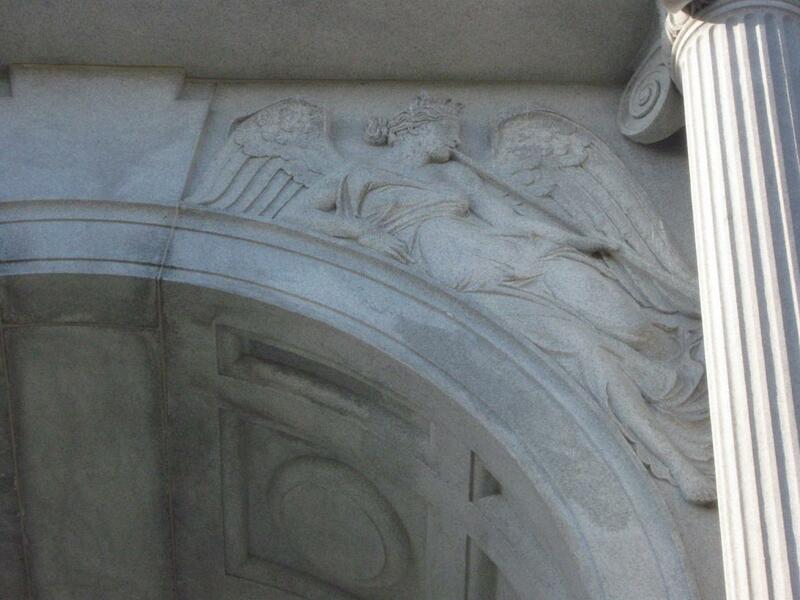 Sculptor Samuel Murray of Philadelphia also did the classical maidens in the spandrels (the space between a curved figure and a rectangular boundary) above and flanking the arches. This view was taken facing southwest at approximately 9:45 AM on Thursday, December 25, 2008. The maidens serve as the attendants to “Victory,” and each holds a trumpet or a victor’s wreath. This view was taken facing southwest at approximately 9:45 AM on Thursday, December 25, 2008. 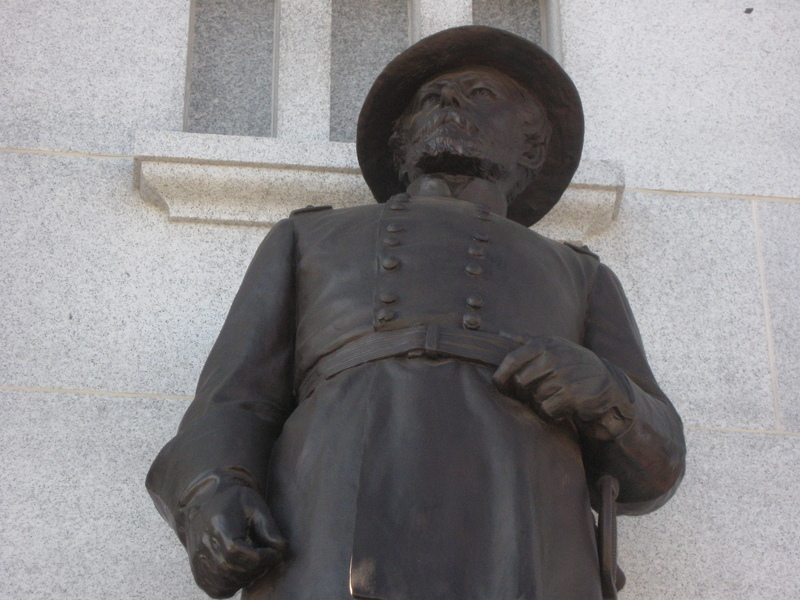 Both of the bronze monuments on the east side were sculpted by Jakob Otto Schweizer. Schweizer was born in Zurich, Switzerland in 1863, and lived in Philadelphia at the time that he received the commission for the statues. The statues are eight feet tall. 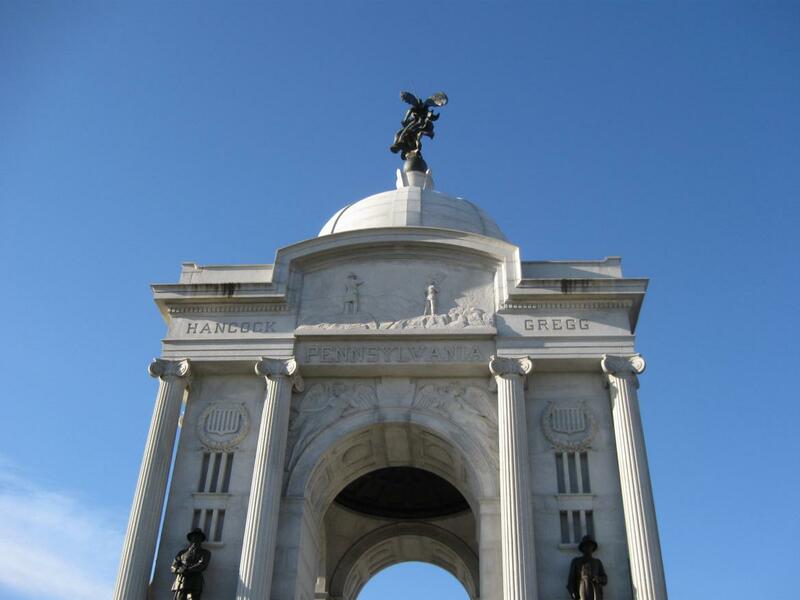 The statues on the monument, outside of President Lincoln and Governor Curtain, are Pennsylvanians who were corps and division commanders at Gettysburg. Brigadier General David McMurtry Gregg commanded a cavalry division during the Gettysburg campaign. This view was taken facing southwest at approximately 9:45 AM on Thursday, December 25, 2008. 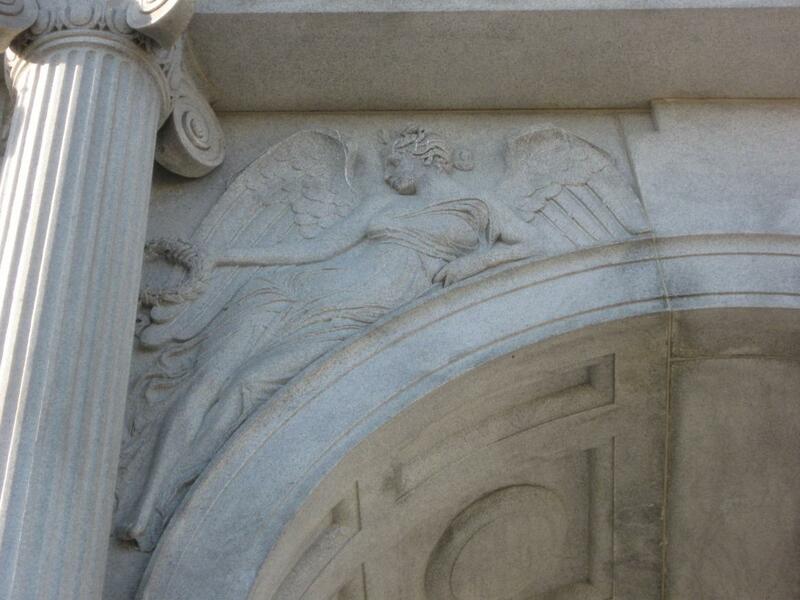 It is very interesting to see the details that the sculptors put in these statues. Veterans seeing these statues after they were installed could easily see the ranks of these individuals. For instance, on the frock coat, Brigadier Generals, such as Gregg, have a specific pattern to their general service buttons: four sets of two buttons each. The fourth set, of course, is hidden by Gregg’s hands. This view was taken circa 1910. 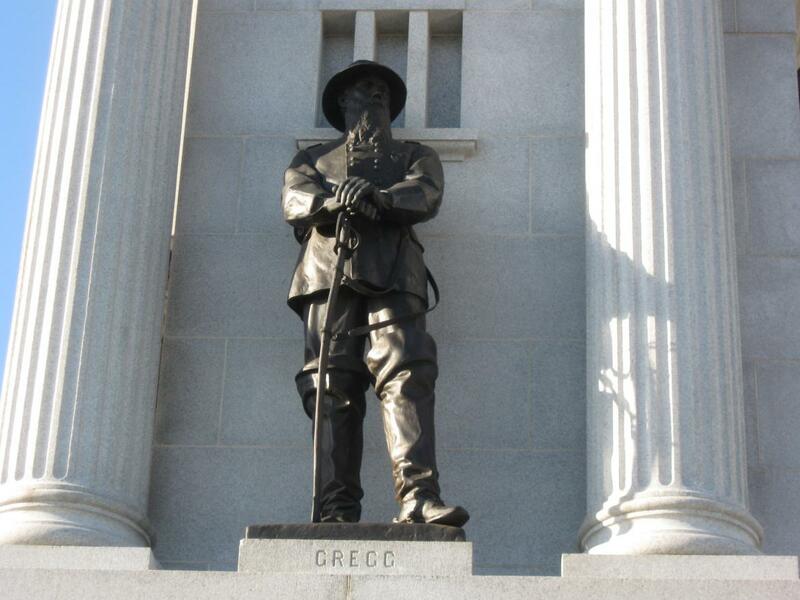 Gregg was present at the dedication of the Pennsylvania monument in 1910, and gave a speech on the operations of the Union cavalry during the Gettysburg campaign. 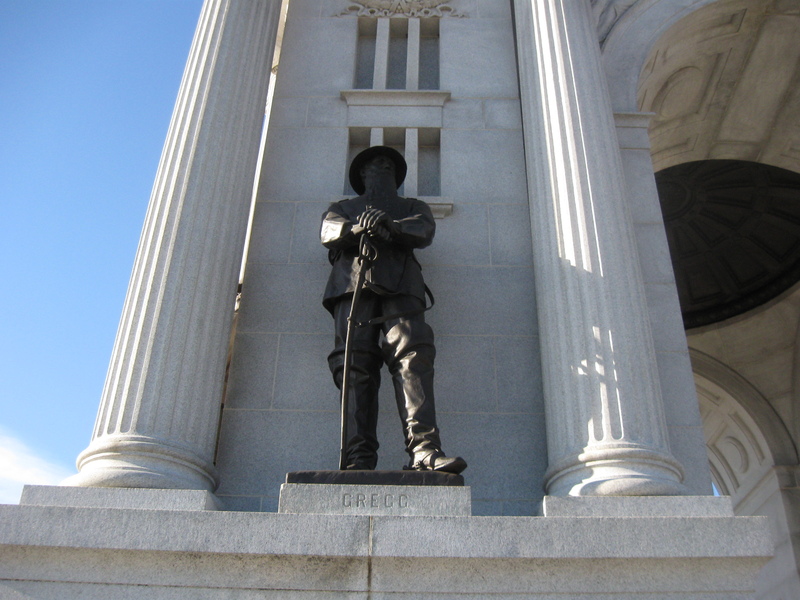 Gregg died in 1916, three years after this statue was erected. This view was taken facing southwest at approximately 9:45 AM on Thursday, December 25, 2008. 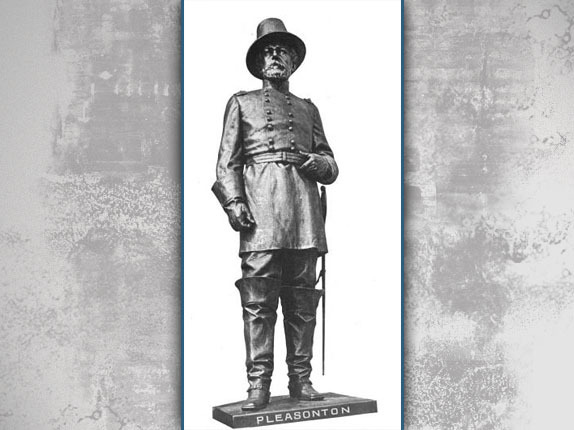 Major General Alfred Pleasonton commanded the Cavalry Corps of the Army of the Potomac during the Gettysburg Campaign. This view was taken facing southwest at approximately 9:45 AM on Thursday, December 25, 2008. Schweizer was also very detailed on the general service buttons for Pleasonton’s frock coat. Major Generals, such as Pleasonton, wore three sets of three buttons each. The last buttons of the third set are hidden by Pleasonton’s belt. This view was taken circa 1910. 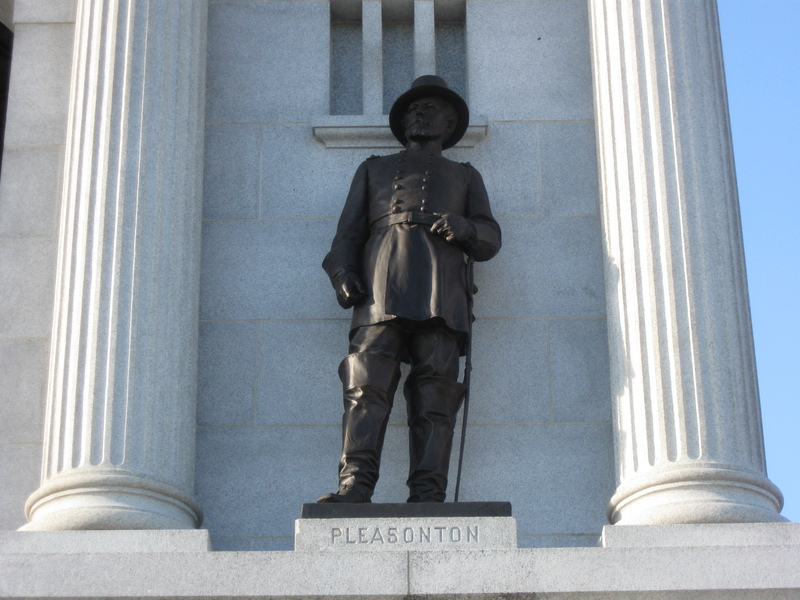 Major General Alfred Pleasonton died in Washington, D.C. in 1897 at the age of 72. 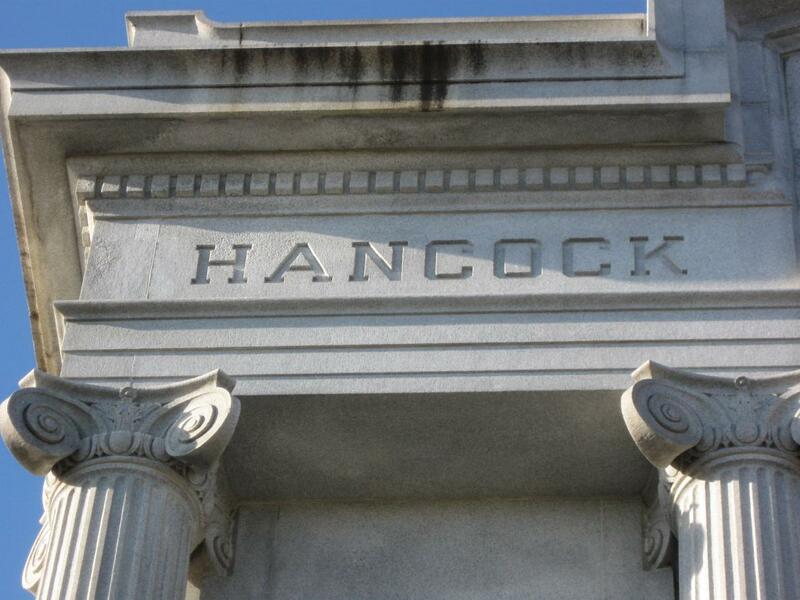 He is buried in Washington’s Congressional Cemetery. This view was taken facing southwest at approximately 9:45 AM on Thursday, December 25, 2008.